This system is ideal for simple paging requirements such as push-for-service service counter buttons or calling managers to the front of the house when things get busy. 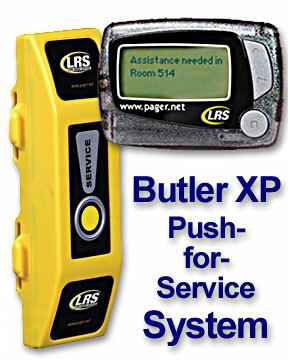 The set includes an LRS Yellow Butler XP one-button push-for-service transmitter and an alphanumeric text display pager with belt clip. The Butler XP is weatherproof and tamperproof so it may be permanently mounted outdoors, such as for poolside service or at entrance doors as a wireless doorbell. 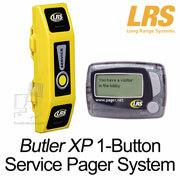 This item is a simple paging system with one yellow Butler XP one-button transmitter and one alphanumeric text display pager. 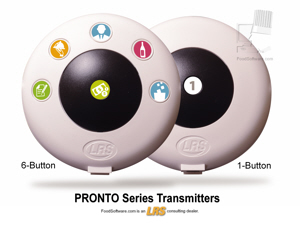 Place the Butler XP transmitter anywhere, indoors or out, so anyone may contact your staff with the push of a button. This system is ideal for simple paging requirements such as push-for-service service counter buttons, poolside service or at locked entrance doors as a wireless doorbell. In restaurants, use this to call the manager to the hostess station or cashier's counter when things get either too hectic to look around or so slow that the staff seems to disappear. The Butler XP transmitter is weatherproof, tamper resistant and battery-powered so it can be mounted and kept outdoors. It comes in yellow, black and gray case colors and a wide choice of secure mounts such as steel wall plates, nylon tie wraps or velcro bands. The text message it sends can say where the page is from. When using multiple Butler XP's, the text messages are often used to call staff to specific locations with custom messages that say where the call was from: which table, door, work station, etc. Messages can be up to 200 characters long. Transmitters can call one or more pagers. The call button can be programmed to call any single pager or groups of pagers. Waterproof and tamper resistant, it is ideal for outdoor use. Dimensions: 2.75" x 7" x 1.375"
Choice of yellow, black and gray case colors. An optional programming kit includes USB interface and software for programming with PCs. Custom programming by the factory is available. Can send to any designated single pager, any two pagers ("shadow pager" feature), or pager groups (up to 99 groups). Can automatically re-page with the ability to program how often you want it to re-page (from 10 seconds to every 5 minutes, up to 10 minutes maximum). The re-paging feature alerts an additional manager pager if the original page is left uncancelled. Automatic Repaging: Butler XP transmitters have an advanced automatic repaging feature to help ensure staff response. You can program the Butler XPs so that they automatically keep paging up to three times or until the page is cancelled (which is done by touching the pager to the Butler XP). You can program whether you want the feature off or on, and if on, how long between re-pages (from 10 seconds to every 5 minutes). 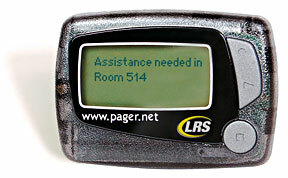 If the page is not cancelled, the page can "roll over" to another pager. Also, a second pager can be signalled along with the first. To specify your color choice: If you use the shopping cart without specifying a color, the default color is yellow. Use the Special Instructions section of the shopping checkout form to specify other color choices. One yellow Butler XP with wall, velcro, and band mounts. Order Options: The default transmitter color is yellow. The default text message is "Service 1". To ask for a different color or text message, use the shopping cart Special Instructions to specify a different color or message. Use the shopping cart options to order either the basic kit with one transmitter and one pager, or the basic kit plus a programming kit. The programming kit is important if you want to program Butler transmitters yourself.